October 23, 2018 – In response to years of prodding from the attendees, speakers and sponsors of the Caribbean Hotel Investment Conference & Operations Summit (CHICOS), the 2018 event will, for the first time, feature a scheduled soccer match between host organization HVS and rival consultancy KPMG. Professionals from other firms will also participate among the two (loosely!) organized teams. “With our global group of participants, this soccer match is sure to be a lot of fun,” adds Jordan. 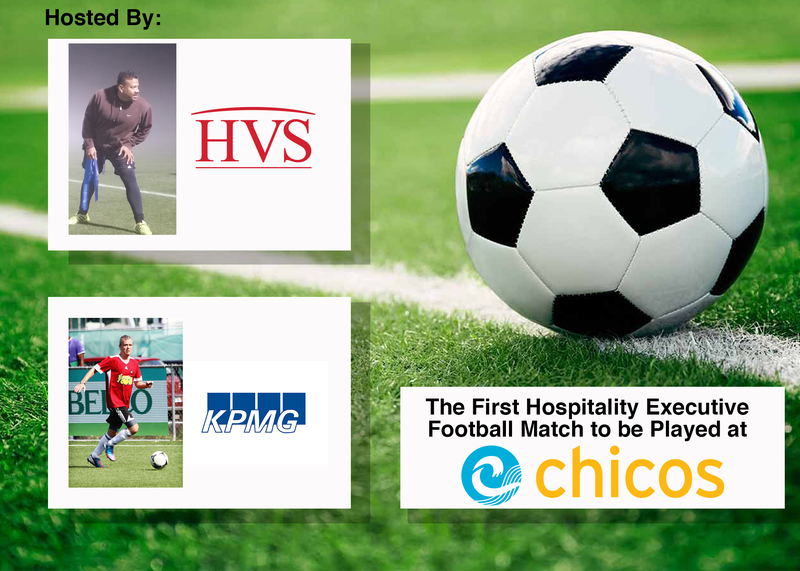 Parris Jordan, Chairman of CHICOS, and Stephen Woodward, Managing Director of KPMG, along with other hospitality executives will face off in the first hospitality football showdown taking place at CHICOS in Bermuda on November 8th. The CHICOS Showdown will be held the first day of the conference, Thursday November 8, 2018, at 5pm on the South Lawn of the Fairmont Southampton Resort, the CHICOS host hotel. Those participating include executives of HVS, KPMG, global hotel brands, government representatives, sponsors, and attendees. For each goal scored by either team, HVS and KPMG will contribute to the Rotary Foundation. This organization has a history of operating with Caribbean nations impacted by hurricanes and works to provide impacted countries with necessities such as water, canned food, and clothing. The organization has outstanding ratings, named by CNBC as one of the Top 10 Charities in the World. Every dollar of the proceeds will be donated directly to beneficiaries in the Caribbean. To participate in the CHICOS soccer match, contact [email protected]. Those interested in spectating can simply report to the South Lawn and cheer on colleagues. For more information about CHICOS and this year’s panel sessions – including discussions about the future of all-inclusive and luxury hotels in the region, debt and equity for investment capital, and more – visit www.chicos.hvsconferences.com. Registration for CHICOS is $1,300 USD per person until October 26, 2018, or $1,500 USD after the deadline. Please register at http://chicos.hvsconferences.com. For the CHICOS preferred hotel rate of $249, please contact the Fairmont Southampton or click here: https://book.passkey.com/event/49566898/owner/19579/home. The CHICOS 2018 agenda is now available online at http://chicos.hvsconferences.com/agenda.